Request Your Copy of This Timely and Helpful Book! We’ve all seen them: Lawyer ads. They all seem to brag about the same tired things—decades of combined experience, promises of “free consultations,” and how much they "care." You owe it to yourself to do your research before you do your estate planning. Get the inside secrets from a lawyer with over a decade of experience doing only wills, trusts, and related work, who has reviewed thousands of documents written by other attorneys, and who can help you avoid getting ripped off, if you can take just a few minutes to learn a simple Six-Step process for choosing your attorney. How not knowing what you don’t know can be disastrous and why you need to work with a professional who will take the time to educate you about your options and how to best protect your family. Why a lot of lawyers actually love LegalZoom (and why a lot of clients end up regretting it). A 6-Step System and a sample Scorecard for finding the right estate planning firm for you. And much more! 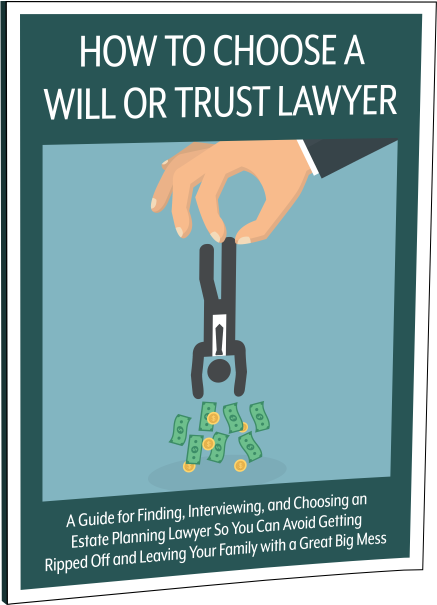 This book is designed to empower you to find the right lawyer for your needs. Don’t take a gamble on the future well-being of you and your family! This is not the time to seek out the “cheapest” or seemingly “easiest” option. A well-rounded estate plan that truly protects you and your family is an investment in the future. A lot is at stake. If you’ve worked hard to provide for your family, don’t let it all get flushed down the drain because you (or your lawyer) cut corners. Take the time to do things the right way. Your family deserves it.